The Iron Throne calls to those who would rule the lands of Westeros. Many have fought and died for the chance to call themselves Kings of the Andals, the Rhoyar, and the First Men. Armies have been raised in support of those who would call themselves Lord of the Seven Kingdoms. Knives in dark alleys, poisons in golden chalices, and sharp tongues have cleared the path for those who rule. However, only one can claim the throne. In A Song of Ice and Fire: Tabletop Miniatures Game from CMON and in partnership with Dark Sword Miniatures, players battle to place their House atop the legendary throne as ruler of Westeros. A Song of Ice and Fire: Tabletop Miniatures Game is a new miniatures game designed by Eric M. Lang and Michael Shinall. You and your friends will lead armies from your chosen Houses into battle, controlling trays of infantry, cavalry, and more from throughout the A Song of Ice and Fire novel series. 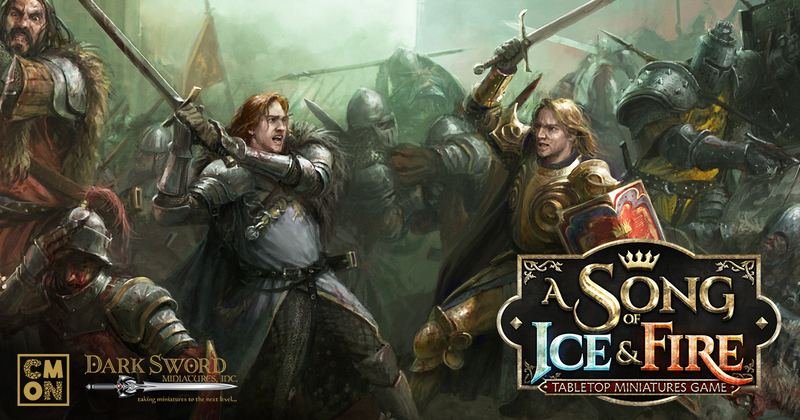 Iconic characters such as Jaime Lannister or Robb Stark – both available in the two-player starter set heading to Kickstarter later this year – can lead your troops, providing special abilities to the units they are assigned to. Even those who choose a more political battlefield, such as Cersei Lannister, have an impact on the battle by giving new tactical options via the Tactics Deck. The rules are designed to allow veteran tabletop miniature players a wealth of strategy, while players new to the table will find the game accessible and easy to learn, no matter the size of the battles. You will form your armies by bringing together units from your chosen faction. These units are brought to the table in trays, ranging from one to twelve models depending on their type. Combat is resolved with an intuitive D6 system. As units engage in combat, models are removed from their trays to indicated damage received during fights. Depending on the number of models left, a unit’s stats will change. Keeping track of your armies’ stats and abilities is simple as each unit and named characters have one card featuring all the info you’ll need for them during play. Alternating activation (where one player takes an action and then the other player does) means you’ll never find yourself waiting for your opponent to move their entire army. So, no matter what scale you play at – a small battle of a few units per side or recreating the grandiose battles from the books –, the action never stops. And even when you’re not attacking, you’ll have options thanks to the innovative Tactics Deck. Based on the heroic figure leading your army, your Tactics Deck will be modified, allowing you to play cards that can alter attacks or give you the upper hand when engaged by the enemy. Non-combat characters (NCC), such as Cersei, will allow you to claim multiple spots on the Tactics Board, a key companion to the Tactics Deck. Claiming these spots will grant your army powerful benefits for the round, and also unlocks additional effects and abilities from your Tactics Deck and NCC characters. Each faction is designed to bring a different feel to the game. For example, House Stark is full of in-your-face aggressive units. They love to close in on enemy forces, utilizing their increased maneuverability and positioning, and take them on in hand-to-hand combat. House Stark fight for their cause, as such their stalwart determination makes them even more dangerous the more desperate the situation. Heroes like Robb Stark fill their Tactics Deck with straightforward sorts of cards, like adding to charge ranges. Contrast that against the House Lannister. Instead of trying to simply stab their opponents to death, they will work at bringing down an enemy’s morale using different status effects. Due to their great wealth, the Lannisters have the best weapons and armor money can buy. Their Tactics Deck is filled with intrigue, playing at the mind of their foes. But money only goes so far when one’s life is on the line. The Lannister morale can be rather shaky, as you can’t spend your pay when you’re dead. The highly-detailed miniatures in A Song of Ice and Fire: Tabletop Miniatures Game are all-new sculpts based off original art created for the game by CMON’s talented crew and approved by George R.R. Martin and his team to ensure they fit the vision of his world. Models come pre-assembled and are plastic with ABS weapons that prevents bending. The initial Stark vs Lannister two-player starter and future unit boxes are all playable out of the box. Units have multiple sculpts, giving armies strong, visual variance. Extra details on unit leaders and bannermen (for those units that have them) add even more variety. A Song of Ice and Fire: Tabletop Miniatures Game lets you recreate your favorite moments from the book series, as well as any sort of “what if…?” scenarios you and your friends might come up with. The game begins shortly after King Robert Baratheon has died. From there, it’s up to you to see how things turn out in Westeros. Perhaps the Red Wedding never happened and Robb Stark assaulted King’s Landing. Or what if the Battle of Riverrun turned out differently? Hero models in the game will also have different versions with varying stats, abilities, and sculpts depending on the point in the novels they are pulled from. A Song of Ice and Fire: Tabletop Miniatures Game brings all the excitement and intrigue of George R. R. Martin’s books to your gaming table. With its easy-to-learn rules, quick play time, incredible scalability, and numerous options, you will be able to dive right in and feel like you are leading an army to conquer King’s Landing to claim the Iron Throne. But how long before someone comes to challenge that title? Discover much more about the game on Kickstarter when the game launches later this year. And follow the official Facebook page to see previews of models now!